I was suprised to see all this work going on down in the dark depths of Bretonside Bus Station. 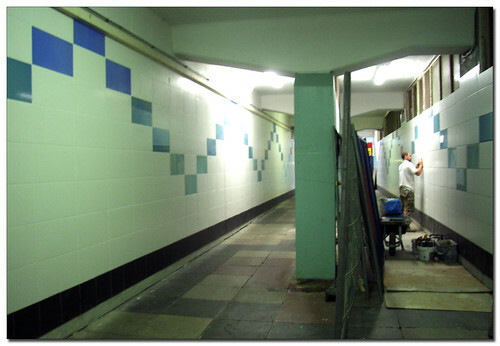 They have lined the tunnel with new tiles which has certainly made a big difference in this area of the station. It is making it a lot brighter. Sadly the rest of the station is just as bad and run down and uninviting as it always has been. On one hand I am glad to see this work going on to brighten things up - on the other hand - it clearly means that any plans to redevelop this area are a long way off. I can somehow see my blogging about this place for several years yet. Went through there today and it's already graffitied. But what struck me most was the muszak!